In 2005 four friends from the San Francisco Opera and Ballet Orchestras who loved playing chamber music, and especially loved playing with each other, resolved to form a string qukaret. When we were looking for our name, we considered names of Bay Area landmarks and other nearby places, including the Temescal District and Lake Temescal in Oakland. When we discovered that a temescal is a ritual bath house found in pre-Hispanic Mexico which was used to bring physical and spiritual renewal, that concept spoke to our collective reason for being, and the four of us became the Temescal String Quartet. We are committed to each other as much as we are committed to the music we perform, and our friendships with each other have developed over many decades. Barbara and Jonna first met at a master class with the Guarneri String Quartet when they were barely 20. They discovered not only a common musical language, but a deep and enduring friendship. Violinists Barbara and Katie met sometime in the last century, when they often shared a stand in the San Francisco Ballet Orchestra. Again, their musical sympatico developed into a wonderful friendship, and eventually into a string quartet with Jonna. When it became necessary to find a new cellist, we found someone of like mind and spirit in Nancy Bien, who joined us in 2015. Katie and Nancy had been aware of each other from the free-lance circuit, where they sometimes found themseles on opposite sides of the orchestra.. Katie was always impressed by how easy it was to play with Nancy when they were hired to play for weddings together. That ease of communication, combined with Nancy's expressive and committed playing, was confirmed the first time she sat in with us. 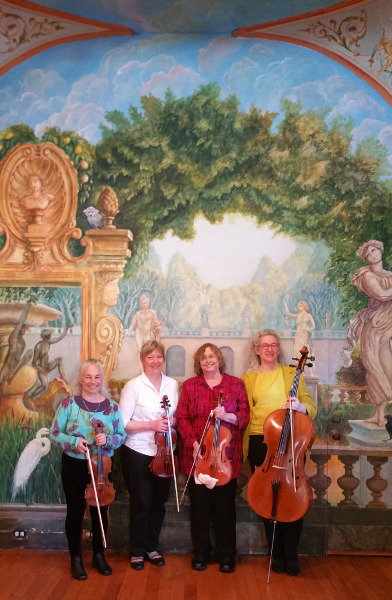 Nancy joined the Temescal String Quartet in 2015, and naturally, we have all become fast friends. So, the music and the friendship are all mixed up together, part and parcel of each other. We find we can't have one without the other. We love to play with each other, and it shows. (The Temescal Quartet) "performed with an ideal melding of ensemble. Ego was never an issue, and all were of a single purpose. As they played, the listeners were drawn in, and by doing so we encountered the glory of the music as if we were members of a transcendental partnership." -- Joseph Gold, The Musical Gourmet, June, 2018.